Figure 1: A drawing of the Rasad satellite by turbosquid. Yesterday, Iran launched its second satellite, Rasad-1 (Observation-1), into orbit. The SSN data shows that the satellite is in a nearly circular orbit, with an apogee of 297 km and a perigee of 236 km, and an orbital period of just under 90 minutes. This generally agrees with the altitude announced by Iran. The data also shows that the satellite has an inclination of 55.6 degrees (the angle between the plane of the satellite’s orbit and the equatorial plane of the earth). This means that the launch was in a direction about 45 degrees north of due east. That carried it up over Kyrgystan and Russia. To see Rasad’s orbit in Google Earth, go to Wang Ting’s What’s Up website. 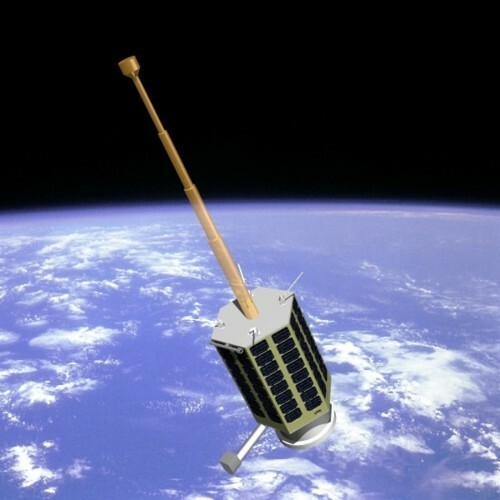 The first Iranian satellite, Omid (Hope), was launched on February 2, 2009. It had a mass of 27 kg (60 lb) and followed a similar orbit, although somewhat less circular, with an apogee of 384 km and perigee of 253 km. Because of its low-altitude orbit, atmospheric drag caused Omid to fall back to earth in less than 3 months, on April 25, 2009. The lifetime of Rasad should be somewhat shorter because of its lower average altitude. Rasad is reportedly an indigenously produced imaging satellite, although it is unlikely to be very capable as it is so small. The body of the satellite appears to be roughly 40 cm long and 25 cm in diameter, and is covered with solar cells to provide power. If its reported mass of 15.3 kg (34 pounds) is correct, it is lighter than 96% of all actively working satellites. One report states that it will beam back to earth pictures with 150-meter resolution. Keep in mind that a typical resolution of Google Earth images for most of the earth is about 15 meters and for images of the United States is about 1 meter. Claims that Rasad would be used to produce high-resolution maps of the earth are not true. So the goal of the satellite appears to be to give Iran experience with developing and operating satellite technology. The satellite, for example, will transmit back pictures to several ground stations that Iran has built, and it uses a long arm that it extends once it is in space (called a gravity gradient boom—shown in the top of Figure 1); this is a common way to control the orientation of satellites so that the antenna points in a direction that allows them to communicate with ground stations. The launcher used in this case appears to be very similar in appearance and capability to the Safir-2 launcher used to launch Omid. In February, President Mahmoud Ahmadinejad unveiled four new prototypes of home-built satellites Iran hopes to launch before March 2012, although that seems unlikely to happen. In the picture below, the Rasad satellite is on the left. It was reportedly built at the Malek Ashtar University in Tehran. Figure 2: Iranian satellites on display in February. Next to it is the AUTSAT-1, or Amir-Kabir 1, named after the Amir Kabir University of Technology (AUT) where it was built. It is reportedly 80 kg and is said to be designed for remote sensing of natural disasters and surveying agricultural lands. It is apparently intended to be placed in a 661-km altitude sun-synchronous orbit, which requires an orbit with an inclination of 98 degrees. Sun-synchronous orbits are typical for earth-observing satellites. Due to the mass and altitude of the orbit, this would require a significantly more capable launcher than the Safir. The two satellites on the right side of the picture are Zafar (Victory) and Fajr (Dawn). More on them in a future post.